To quote Sadi, "A garden is a delight to the eye and a solace for the soul." Here at Bunga Wangi there is inspiration and beauty at every turn; the early morning sunlight glinting on the golden birds of paradise, the fallen frangipani scattered along the stone paths, the late afternoon shadows dancing across palm fronds. The garden is an endless source of wonder, and makes me yearn to do something creative - actually I take hundreds of close-up photos of flowers. We loved the meandering pathways, the constant trickle of running water, the pool fringed with tropical foliage and the intricate detail in everything, from the stone statues to the elaborate floral carvings in the furniture and doors. 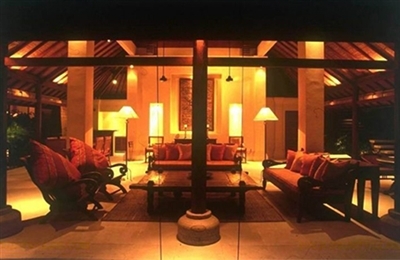 We happily made allowances for the dated design, faded furnishings and occasional hints of must – this was part of the rustic charm and authenticated the Balinese experience. But this villa won’t be everyone’s cup of tea: there is nothing sleek or sophisticated here, no contemporary edges or gadgets (apart from iPod docks and satellite TV), this villa is like your favourite old jumper, perhaps a little tatty around the edges but warm, cosy and a perfect fit. 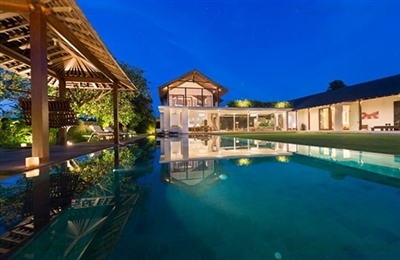 This villa is chic and contemporary in style, whilst also oozing Balinese charm in its design and landscaping – the best of both worlds. The owner has obviously brought in top architects, landscape and interior designers to help realise his dream. The riverside location is enchanting, perhaps a little out of the way for some but well worth the extra few minutes travel time. 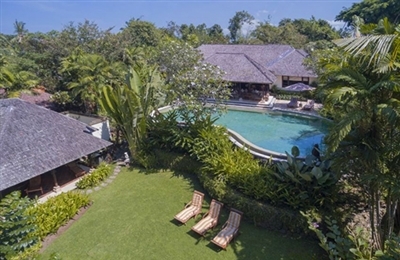 Villa Tukad Pangi is very private and peaceful and perfect for a retreat – both romantic or for a small group. The villa is a great base for families with older children, but it’s not ideal for the very young as there are no railings separating the veranda from a drop to the riverside. It is not perfect for seniors either as the pools could be difficult to get in and out of, and there are several steps down to the lower level. There are plenty of spots to relax, read a book or watch a movie, so groups would not get on top of each other when the villa is at full capacity. It’s a fabulous place for a cocktail or dinner party with the pools and garden lit up romantically at night. The kitchen is fit to cater for a banquet … and the chef will happily oblige. We enjoyed some excellent meals at Villa Tukad Pangi and the team of amiable staff were amongst the best we have experienced in Bali. 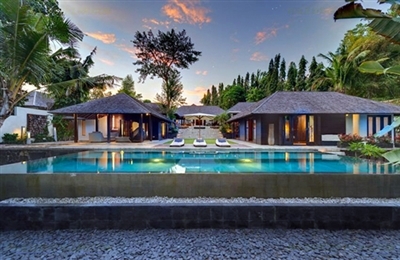 A stay at Villa Tukad Pangi is akin to having a five-star retreat all to yourself, and comes highly recommended. It was nice to be greeted by the same familiar faces when we came back to the villa after three years. Nothing has changed in this sleepy rural riverside locale except perhaps the trees getting a little taller. Still such a beautiful retreat and one we were happy to return to. The rate now includes a car and driver for eight hours a day (excluding petrol), which makes the villa’s remote location less of an issue.